Another Treasury Edition brought home by my father, and proof positive that we were in the closing months of 1974. I would have been reading comics for a year and a half at this point. 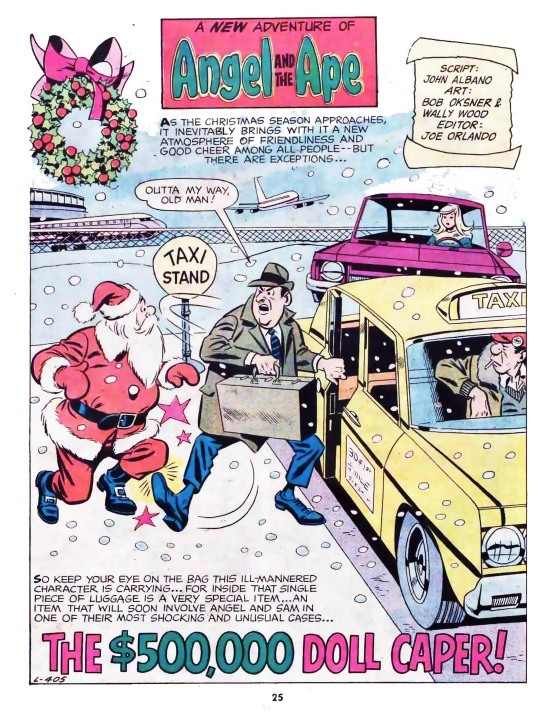 These Christmas Specials used to be a regular thing, attractive even to more casual purchasers as something that could be given to a child during the holiday season. And they were often a great grab-bag of material. The book opens with a Denny O’Neil/irv Novick Batman story in which the masked manhunter helps to redeem a fellow on the way to becoming a career criminal. It’s a good yarn, one that makes Batman skillful and competent without going so far as to make him superhuman, as many later stories have done. 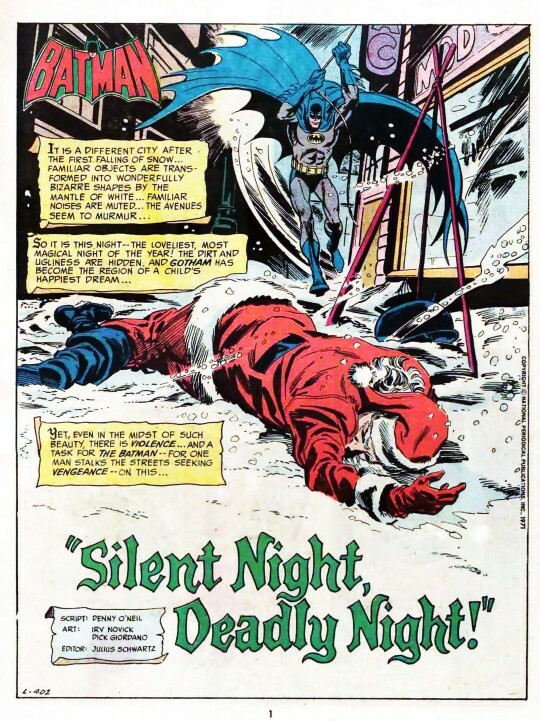 The plot also turns on batman coming across an abandoned sled at a crucial moment, put there he figures by the end by divine providence. Next is a nice, lightweight Captain Marvel story in which both Billy Batson and the Big Red Cheese purchase Christmas gifts for one another. 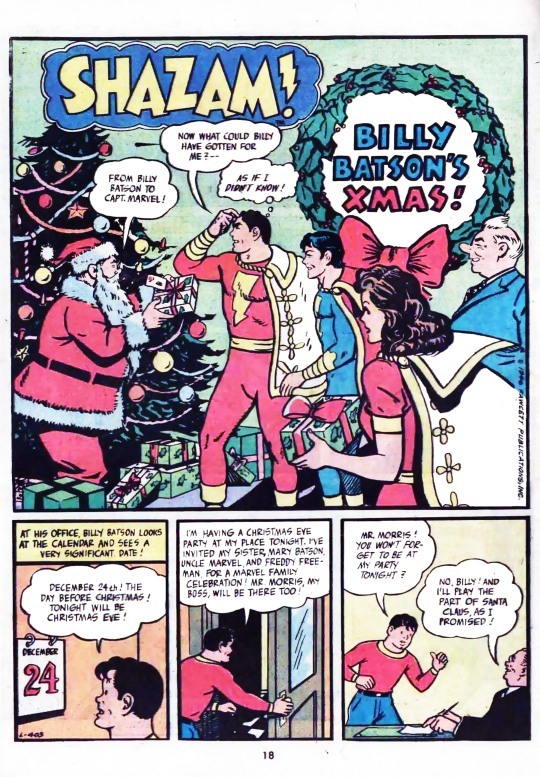 There’s a bit of a complication when Captain Marvel agrees to fill in for a fired Santa Claus at the same time that Billy’s party will be taking place, but it’s all handled without anybody getting too worked up over it. The reproduction on this story is a little bit shaky. This is followed by a fun Angel & The Ape story which, not having anything to do with super heroes, didn’t really hold my attention as a kid, despite some lovely Bob Oksner artwork. It concerns the search for a particular doll that has a diamond hidden inside it. 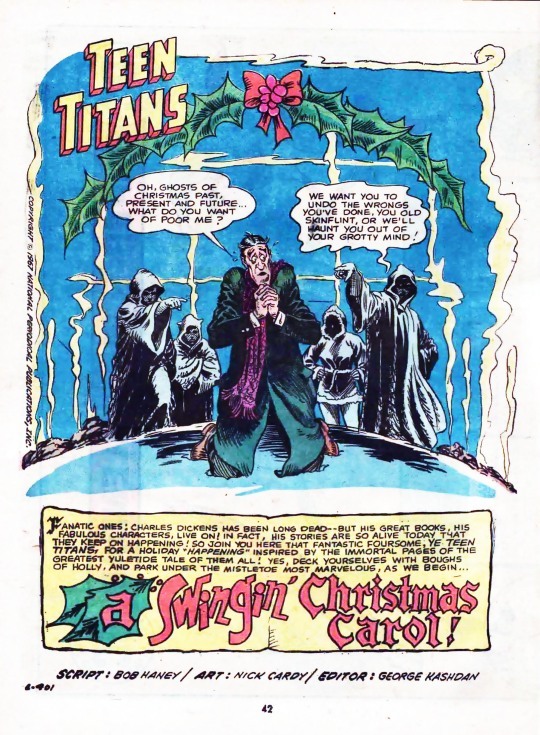 A well-remembered story is up next, this being Bob Haney and Nick Cardy’s retelling of Dickens’ A Christmas Carol in the guise of a modern day Teen Titans adventure. All the names are slightly changed, and they hang a lantern on it as the Titans themselves become the three ghosts who visit corrupt Ebenezer Scrounge, and there are a bunch of crooks involved so that things don’t get too dull along the way. 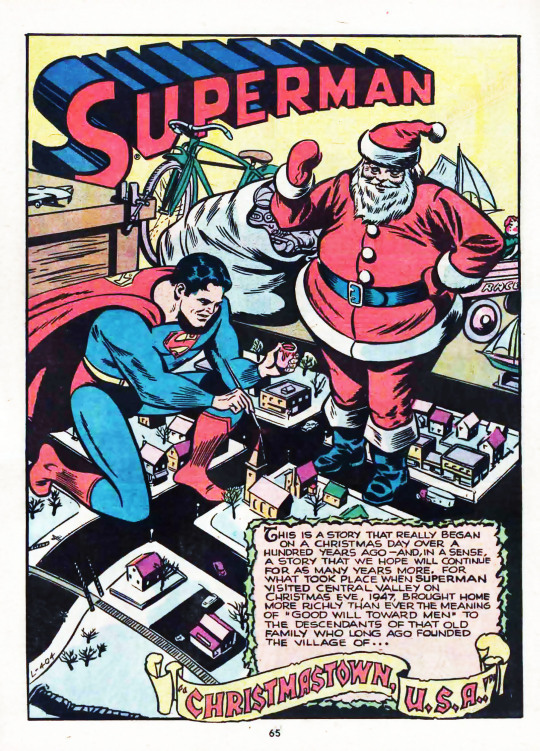 Finally, the book closes with a vintage Superman adventure in which the Man of Steel helps to save Christmastown and locate the missing grandson of its ceremonial Santa Claus. The reproduction on this story is awful, and has obviously been extensively reinked by Vince Colletta, which doesn’t help. It’s a charming enough tale, but the reproduction takes away from a bit of its charm. 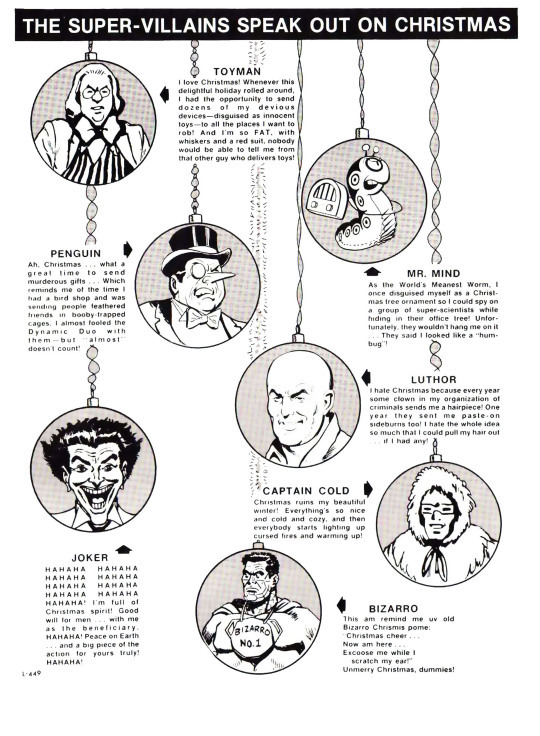 And the inside back cover carries the last word, from the villains of the DC pantheon and their opinions on Christmas. It’s pretty cornball stuff, but I sometimes miss the days when we could do something this fun and silly with the characters, and the audience would accept it with a straight face.